Working in conjuction with Mountain Town Brewing Company, we have cooked up (brewed, actually) three brand new signature beers - one for Old City Hall, one for American Kitchen and one for Tavern 101. Each beer is a unique style, designed to fit the restaurant we've created it for. 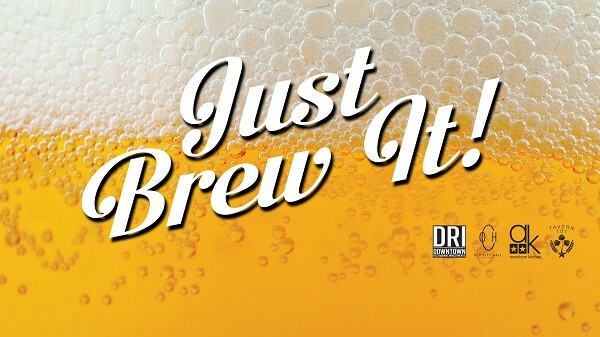 On January 21st, you can be among the first to try our new beers at our JUST BREW IT! party. Your $20 ticket (2 for $30) gets you a 4oz sample of each beer paired with a specific appetizer, designed to go together. We will start the evening at 6PM in the Private Room at Old City Hall, sampling the beers and appetizers for OCH and AK. After that, we'll head to Tavern 101 for the third and final pairing, which will include a dessert pairing along with the beer. From 8-11PM, Andy and Ned from Domestic Problems will be playing at Tavern and we'll be collecting names for a drawing at 10PM. You don't want to miss this. Everyone is welcome to purchase the beer on the evening of the event, but only ticketholders will receive the sample and food pairing. Downtown Restaurant Investments functions to bring energy, diversity, and personality back to the heart of downtown in the form of fine dining.